It started out as a harmless boast in a quiet Innsmouth pub. But what seemed an unlikely drunken yarn will quickly become a living nightmare, as you and your fellow investigators set out to find the truth behind rumors of ghastly human reanimation! Can you solve the mystery behind these gruesome rituals, or will become their next unholy sacrifice? 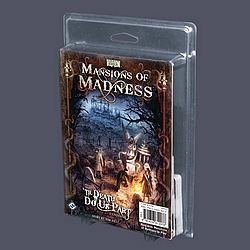 ‘Til Death Do Us Part is a Print on Demand story expansion for Mansions of Madness! Designed by Tom Jolly (Cave Troll, Wiz-War), ‘Til Death Do Us Part tells a story of love, loss, and dark arcane rituals. Enlist the posthumous aid of an unlikely killer’s past victims... or you might just join them for eternity. Note: Due to variations in the printing process, cards from Print on Demand expansions will be subtly different in appearance and texture from base game cards. For this reason, 18 of the 58 cards in this expansion are reprinted from the base game to retain a consistent appearance when shuffled, and 40 are unique to ‘Til Death Do Us Part.